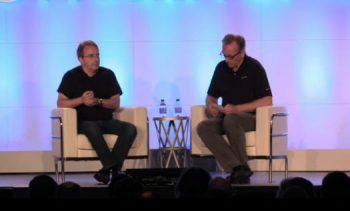 Much of what Linus Torvalds talks about in this excerpt from his onstage interview at LinuxCon 2016 will be recent memories for many of our readers. For others, it’ll be ancient history. Linus Torvalds being interviewed by VMware’s Dirk Hohndel on the last day of LinuxCon 2016. He’s always a good interview and gives the interviewer and the audience what they want. Although he limits his number of speaking engagements, it’s obvious that he likes sitting down for these Q&A sessions, which he often does with Hohndel. He’s relaxed and works from his head instead of from any prepared notes — thinking on his feet and speaking off-the-cuff, often speaking in run-on sentences or changing his approach mid-sentence, which requires a bit of editing to convert into written text. “The highlights are really hard to even mention because mostly it’s been really, really good,” was Torvald’s short answer. “The moments where I went ‘this is awesome’ that I remember clearly have been when I’ve been struggling with something that just took forever, like I was struggling on the same thing for weeks and nothing worked. Most of those were actually very early on. “The reason nobody sane does operating systems from scratch is that when nothing works it is really, really frustrating. But then even the slightest sign of life makes you go ‘wow, I really mastered this machine.’ When the first character shows up on the screen, and the system does nothing else, you’re really pumped because you actually brought a character on the screen. Completely useless, but those early times were actually some of the most memorable for me, when nothing really worked and you go from that nothing to something. As might be expected, Torvald’s “lowlights” might not have been a direct result of technology, but they certainly revolved around technology. “The developers in the audience may remember, if you’ve been around for long enough, power management was such a bummer for so many years,” he said. “We really struggled with that. It took years and years to get it to the point where you could just take a random laptop and suspend and resume it and just assume that it works. That was very frustrating. But on the whole, lowlights from the technical side have not been a big issue. You have frustrating issues that come up and are hard to debug, but most of the low lights have been really on the social, and especially, the development side when the process doesn’t work. Then there was BitKeeper, the then proprietary source code manager used by Linux beginning in 2002. Because it was proprietary, its use was always controversial, drawing criticism from Linux developers as well as from Richard Stallman. Things came to a head in 2005 after BitKeeper withdrew free commercial use of the project to key Linux developers, including Torvalds and Andrew Morton, which prompted Torvalds to write Git. “Everybody has heard about how BitKeeper was a big failure and how that brouhaha went when I had to go off and make Git work,” Torvalds said. “But BitKeeper actually was a big savior for me personally because the situation we were in from a process standpoint before BitKeeper was such a disaster. Those years during the first decade of the new century were evidently much more stressful on those doing the work of developing and maintaining Linux than any of us on the outside could imagine. Read Part II of our coverage of Linus Torvalds’ keynote interview at LinuxCon 2016. Thanks to Linus Torvalds & Richard Stallman for making the GNU/Linux possible. “Everybody has heard about how BitKeeper was a big failure and how that brouhaha went when I had to go off and make git work,” Torbalds said.